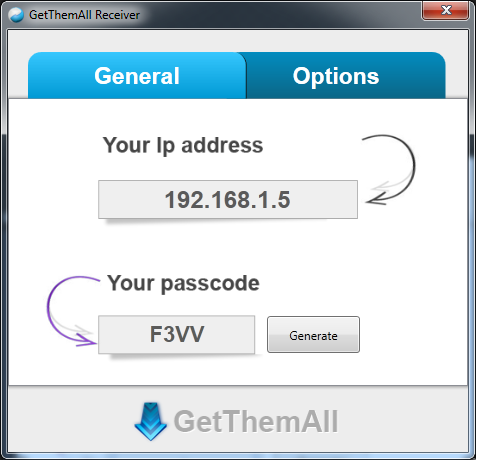 Download and install GetThemAll Receiver. Run the program when the installation is complete. Go to Cloud/PC Settings in the GetThemAll. Type the data that you see in GetThemAll Receiver into the IP and Passcode fields. Choose files and folders that you want to send to your PC. Click Upload and choose Send to PC. The transfer of files will begin. In the case of an IP or Passcode change, you will receive a message warning you about it and will be asked to type in your new IP and Passcode.